Stephanie Guerra is the winner of the 2015 Bonnie Campbell Hill Washington State Literacy Leader Award for her work as a teacher leader, and the 2014 Virginia Hamilton Essay Award for her writing on literary experiences for teens. Her debut young adult novel, Torn, received a starred audiobook review from School Library Journal. Kirkus called her “a strong new voice” and Booklist praised her “complex characters.” Stephanie’s first middle-grade novel, Billy the Kid Is Not Crazy, was noted by Kirkus for its “energy, wit and sensitivity” and “strong characterizations.” She is also the author of the Betting Blind series for teens and the Zach and Lucy series for early readers, co-written with Jennifer Bradbury. 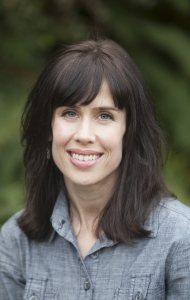 Stephanie teaches children’s literature and writing at Seattle University. She also leads a creative writing program at King County Juvenile Detention Center and researches literacy instruction for at-risk teens. Stephanie’s work has been supported by grants from Seattle Office of Arts & Culture and 4Culture. She lives in Seattle, Washington with her husband and children.